In April, Rick Perrin, is running his first London Marathon in memory of his wife, Claire, who was cared for by St Catherine’s Hospice. Here, Rick shares more. “It was two weeks before Christmas 2014 when my wife Claire was admitted to hospital. She was pregnant with our first son Bertie, and when he arrived into our lives five weeks early, he was perfect. But as we adjusted to being new parents Claire continued to feel unwell. Just seven days after Bertie was born we found out why. 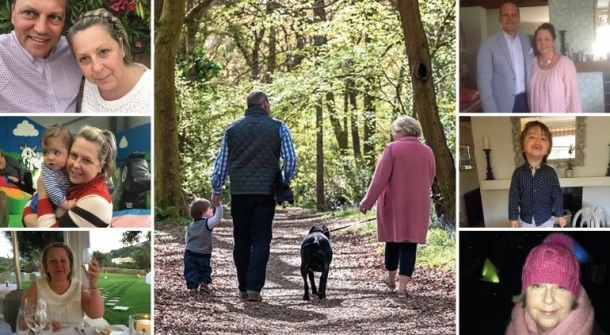 In a meeting room at East Surrey Hospital a doctor told us Claire had stage four cancer. It had spread from her bowel to her liver and her lung. I couldn’t process the news. We’d just become parents. How could this be happening to us now? As we were told that worse case Claire had three months, and best case she had 18 months, she, strong as ever, turned to me and said, “At least we’ve found out what it is”. Up until then we hadn’t known what was wrong. I still remember telling our wider family. Breaking that news felt unbearable. But Claire fought her cancer. She had 48 chemotherapy sessions (I went to every single one), radiotherapy and three major operations, but eventually Claire became less well. I knew she wanted to stay at home, in the home she loved that we’d renovated together, so I and her family looked after her there. During that time St Catherine’s Hospice nurses visited to offer us expert support. They were amazing. They were just like angels walking into our home. Knowing I had their support was a big relief. It gave me some respite and took a weight off me. The hospice nurses cared for Claire with such dignity. They washed and changed her, and controlled her pain. That was so important to me as I didn’t want her to be in any pain. Nurses were always on the end of the phone, day or night, to offer me advice and support too. And their help meant I knew I was doing the best for my Claire. St Catherine’s offered us a place of safety. They were there for us whenever we needed them. And they were like a cushioning to fall onto. They were the kindest, most caring people I’ve ever met. Claire and I were in a situation nobody should ever have to be in. And before she died we had conversations that nobody should ever have to have but I’m glad that I know her wishes for mine and Bertie’s future. Claire was my best friend and my soul mate. We were inseparable. When I lost her, I lost my world, but I’m so grateful I experienced 29 years with such a caring, strong, fun-loving woman. Some people never get to experience the kind of love we did. Now, I feel ready to give something back to St Catherine’s. So I’m running the London Marathon.I’m passionate about raising awareness of the hospice’s vital work. And making sure that other people, going through the darkest days they’ll ever face, can have the same amazing care that my wonderful Claire did. I know that’s what she would have wanted.